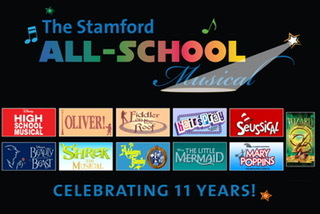 Over the past eleven years, the Stamford All-School Musical has provided quality arts education and enrichment to hundreds of Stamford's children and extraordinary entertainment to tens of thousands of patrons. We have also offered a unique opportunity for many economically disadvantaged children and their families to enjoy their first exposure to live theater at no cost. Your donation will enable us to continue to keep our ticket prices affordable. We hope you will consider making a tax-deductible contribution to help keep this wonderful program going strong.